2 ex-boyfriends of mine walked into a 2009 New Years Eye party I was attending. Only one left unharmed. This is not how I hoped to jumpstart my year of 52 adventures. 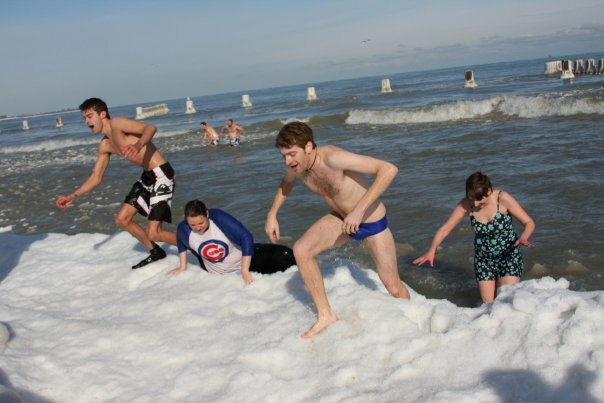 However, as a saving grace, it was the sage word(s) of the unharmed ex who really lent credence and gave meaning to adventure #1: The Polar Bear Plunge. See, after my fist met the shoulder of the harmed one, I put down my drink, found Mark (of the unharmed) and sighed. And sighed. I said how I always chose the wrong men and spoke how how I never learned and reminded him that I had punched someone! Punched him! Like a spoiled child. My racing words did little to suggest maturity and I was lothesome, near tears and without a drink. It was then that Mark, bright bulb that he is, thought to make a methaphor of our upcoming adventure. He said we’d jump into Lake Michigan – together – and that I would wash the harmed ex off me. Then, he said, I could wash me off me. He could wash him off him. There was a moment of silence – humility warrants it, and then Mark and I, on the 33rd floor of a highrise balcony in Chicago hugged. We then eagerly discussed in detail our polar plunge costumes. It should have been easy, sleeping. I had too much to drink and three hours on a comfortable day bed, but I spent that time dedicated to doubt. Whenever I drifted our of consciousness I dreamt of icsicle shavings. They were pretty, almost appetizing, and I’d summon the image of more and more in my sleep. But then, as nightmares are wont to do, the ice would tear at my flesh. I’d wake – stay awake – grow irritated with the waking. Resigned to the fact that I wasn’t going to sleep I got up, dressed, began a feverish mass text to summon spectation, tried to reassure the two friends who agreed to participate that the weather would NOT induce hypothermia, evaded a call from my mom as she was likely to try and dissuade me and finally slipped into a very antiquated swimming dress purchased to supplement my fear of having people see me in a swimsuit from awkward angles. Shawna was the first to arrive. She, a tried-and-true Texan was known to complain about Chicago winters. I still can not attribute her decision to plunge to anything save an innate need to adventure. I met her outside; she, in a down coat, me, in at least three layers, and we shivered and constantly second guessed our decision. The temperature was 11 degrees farenheit and while waiting for Mark I used my iPhone to justify winter swims. It seems the Finnish regularly plunge to boost their immune systems! CELEBRATE! This would make us big and strong! Mark arrived just as we received that good Finnish news and we all feigned relief. I can’t speak to their reticience as not a one of us really made eye contact with eachother on the ride over. Maybe we were afraid of betraying our fear that we, individually would back out. But we talked and talked and talked a non-stop chatter. On site I downed a few quick whiskey shots and we made our way to the snow lined beach. Imagine it. Lovely, right? Now expand your mental image to include another 100 plus restless people strewn across the lake front. Some stripping. Some soaked, returning from the water beat red and howling. There was blood from torn legs and arms and it was only then we noticed the many floating chunks of ice all along the shore. There seemed to be no reprieve. So we watched people run in and out and their final review was always the same – screams for towels, hair turned to ice – complaints of lifeless limbs. The scene was almost gruesome. But before anyone could decide otherwise, along came an army of friends and family with cameras, towels and blankets. My friend Dan surprised me in swim trunks and committed himself to come in with us. So after the last spectator arrived we stripped down, took a photo in near nothing in the freezing cold and just …. ran for the water! There was an ice shelf of sorts at the shore which made it tricky to enter. Mark and Shawna were in first. I gingerly tried to slide in until Mark turned around and pulled me in. I ran, I tripped, I fell in completely but I never once felt cold in the water. I felt wild and stupid. I was screaming but can’t remember what I said. I can honestly admit to feeling very, very free. But… all good things must come to an end and so some seconds later we all ran out of the lake back to our stash of friends, family and clothing. Here’s where things get spicy. Out of the water I couldn’t feel my hands. My legs felt like 1000 ice shavings were having their way with them. My feet turned a very recognizable shade of blue. But I breathed in deep. I allowed my friends to swaddle me in warmth and laughed at the lengths I took to feel momentarily free. If this is baptism by ice, allow me to be re-born next New Year. I may even wear a more revealing suit! I love this, but for the life of me I can’t htink of the new vocabulary term you taught me – something about ritual washing? I think it started with an “A,” but I don’t think it was ablution. What was it. PS – thanks for not punching me. love it! So kicking myself for missing it. 2011?